After unpacking, the first thing I typically do with a new remote control is install the batteries. And that’s when I noticed that the pre-installed screen protector was entirely opaque... and exceedingly well stuck in place. After the obstinate sticker had been pried from the screen surface, I discovered that in the process of removal I had also successfully set the remote to speak Norwegian, and was forced to navigate through mysterious setup menus to switch back to English. The moral of the story is to always remove the screen protector before installing the battery! Besides Norwegian, other language options include Spanish, Italian, German, French and Swedish, plus the ability to use other languages after updating on the net – including Dutch, Danish, Finnish, and a few others that remain unidentified. After language selection the remote asks for your region (continent), 12 or 24 hour clock format, and then lets you set the clock. Once this is complete it automatically steps through a brief 8-screen tutorial that describes how the sliding page controls work, what the main system buttons do, and how the remote will soon be configured. 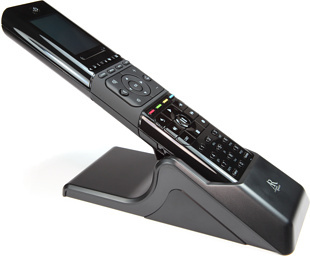 The Xsight then presents two setup options: “Remote” and “PC”. It describes that only basic devices can be configured directly on the remote, and anything more advanced will need to be done via computer. But the apparent idea here is that you can configure your devices first, while you’re near your equipment, and then use the computer for everything else later. And that’s exactly what we’re going to do right now! 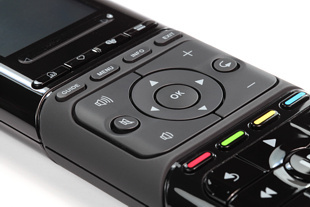 As with almost all advanced remotes sold today, the Xsight Touch includes both a database of preprogrammed device codes and the capability of learning infrared commands from other remotes. The database will allow for quick configuration of common devices whether or not you still have the original remotes, while components or functions not covered can always be taught directly from the original control. UEI is widely regarded as having one of the largest and most complete preprogrammed databases in the industry, so the need to use this learning function should be minimal. When the “Remote” setup option is selected, the Xsight immediately asks for the first type of device to be added. Available options include TV, DVD, Satellite, Cable, Audio, VCR, CD, Home Automation, Digital Media, combo devices, DVR and, if none of these are a match, there’s also an option to create a blank device that can be learned from scratch. After selecting a device type, the Touch prompts for a brand name. Unfortunately it’s here where you first realize that you might have to make use of a computer sooner rather than later: only an exceedingly brief list of popular brands is provided directly on the remote, and for everything else it says to connect to a computer or use manual learning. Just how brief? There were 26 brands of televisions, 24 brands of DVD players, 20 satellite receivers, 14 cable boxes, 24 audio devices... this is but the tiniest fraction of UEI’s normally obsessively complete collection of codes.